Imputed Income in Florida: Friend or Foe? Florida is an equitable distribution state, which means that, in the event of a divorce, the judge can award alimony to one spouse based on what the judge determines to be fair. The emphasis on fairness is more important than dividing things equally or focusing on which assets belong to the couple and which ones belong to just one of the spouses. Generally, the main factors that the judge considers are the financial need of the supported spouse (the goal is for the supported spouse to keep the same standard of living that he or she had during the marriage) and the income of the supporting spouse. Things are not always so simple, though. What happens if one of the spouses can earn an income but chooses not to? In that case, the courts must rely on something called imputed income. What Is Imputed Income, and How Does the Court Determine It? In the simplest possible terms, imputed income is hypothetical income. It is how much the judge determines that the (currently non-working) spouse would be earning if that spouse were working. Imputed income usually factors into a case when a spouse is not working at all, but sometimes the spouse is working, but the judge determines that the spouse is intentionally earning a lower income than he or she could earn, specifically to prevent the court from imposing a heavier financial burden on him or her. The court can impute income to a supporting spouse or to a supported spouse. The goal is to prevent the supporting spouse from evading his or her responsibilities to support his or her children and ex-spouse and also to prevent the supported spouse, if he or she is able to work, from representing an unnecessary financial burden to the supporting spouse. Imputed income can be used in cases of alimony or child support. In the case of Koscher v. Koscher, Daniel and Marcie Koscher divorced after 30 years of marriage. Because of the length of the marriage, and because of Marcie’s health problems that prevented her from working, the judge and both spouses agreed that Marcie should receive permanent alimony. Daniel was laid off from a well-paying job shortly before the divorce was initiated. He spent the next four years trying to start his own business, but never earned anything close to the income he had received from his previous job. The court ruled that Daniel was voluntarily unemployed; four years was long enough for him to find a job with a steady paycheck, entrepreneurial dreams or not. Therefore, it imputed income to Daniel based on what he had earned over the span of his career. In the case of Hua v. Tsung, the court refused to grant permanent alimony to Nancy Hua, a healthy woman in her forties who had been a stay-at-home parent for most of her marriage. It awarded her rehabilitative alimony to pay for nursing school and then imputed income to her based on what she could be expected to earn after graduating. Judges must use their individual discretion when imputing income to a parent or former spouse. Contact Bundza & Rodriguez, P.A. 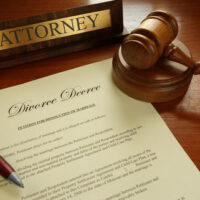 in Daytona Beach, Florida if you think you have reason to contest the amount of alimony or child support awarded in your divorce case.